Round, casual and now with an automatic movement! 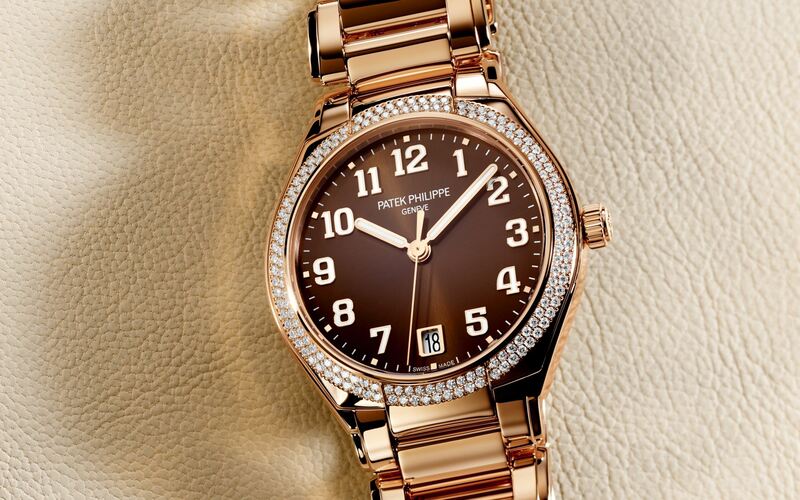 Since its release in 1999, the Twenty-4 has been Patek Philippe’s entry-level model (all genders) and certainly its best-selling women’s collection. Shaped like a bracelet, with a rectangular case seamlessly integrated into a metallic bracelet, it was – unfortunately – powered by a quartz movement (an in-house quartz movement for sure, but still battery-powered). 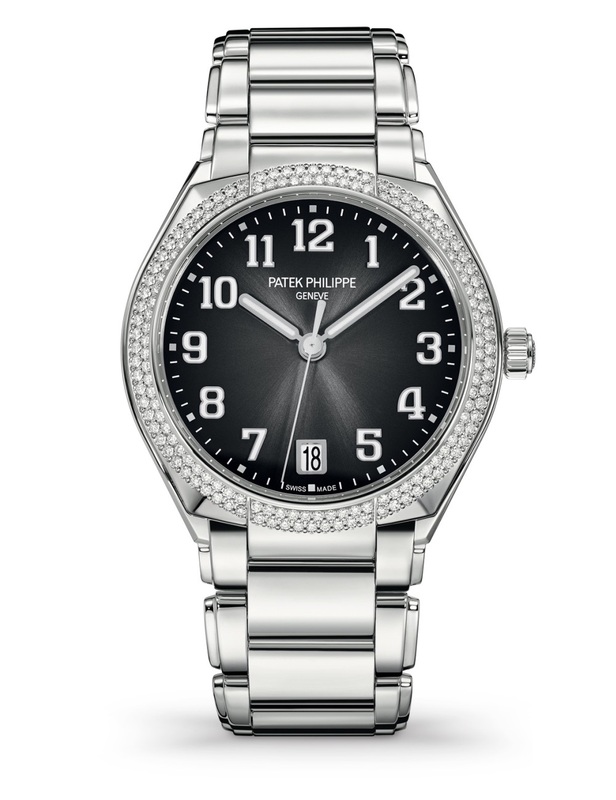 A watch, so to speak, that never really made it as a true Patek in our books. 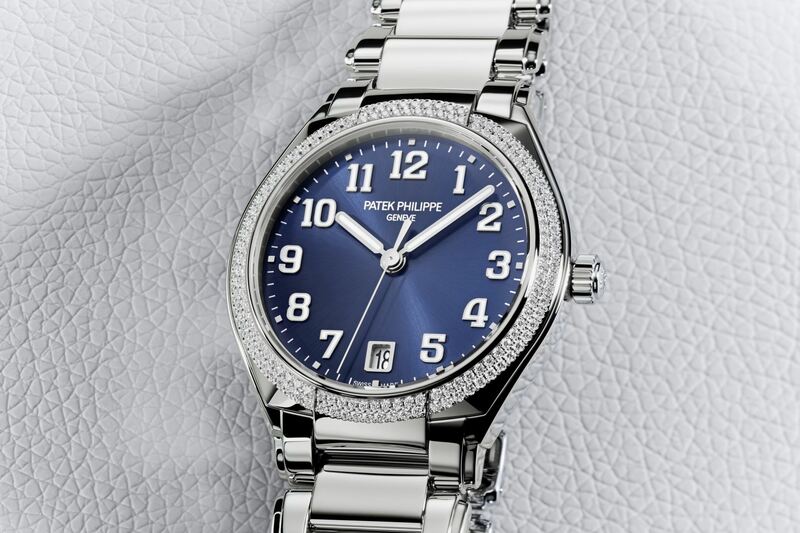 Yet, there’s a new version of the Patek Philippe Twenty-4. 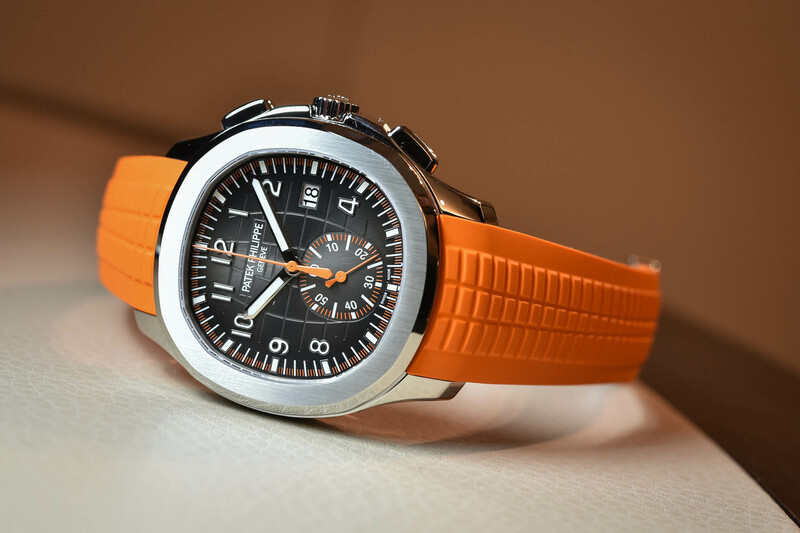 It is round, it is more casual and sportier and it is powered by an automatic movement. The Patek Philippe Twenty-4 as we knew it until today – rectangular, small, bracelet-like and battery-powered. Here is the steel version, ref. 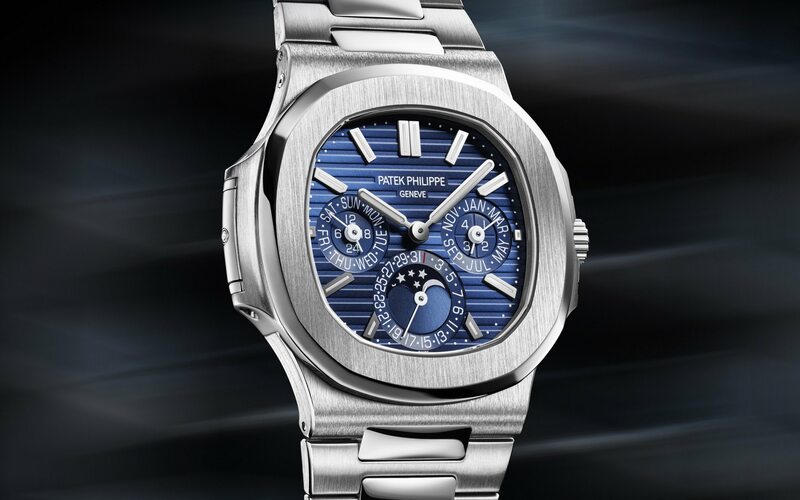 4910-10A, the entry-level model at EUR 11,000 (also the most affordable Patek). 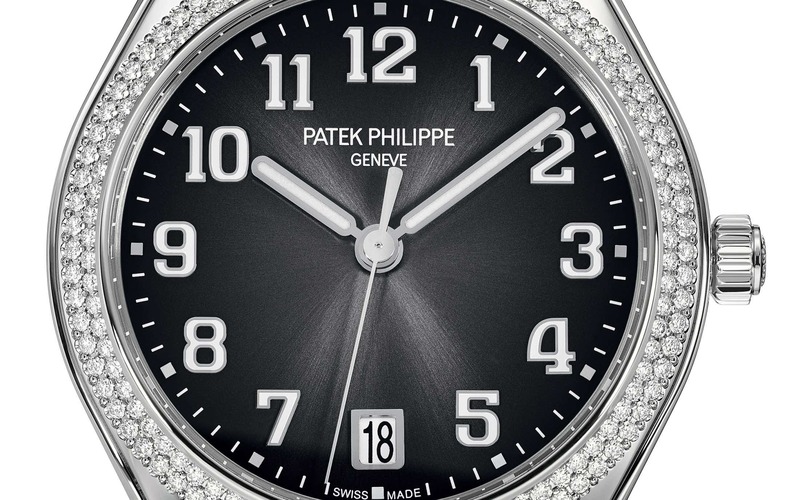 There is no doubt that the Patek Philippe Twenty-4 Steel/Quartz has been a commercial success for the Geneva-based brand. It certainly is the Maison’s most successful ladies’ collection. However, is it really because of its intrinsic qualities or simply because it is the most accessible watch the brand offers? 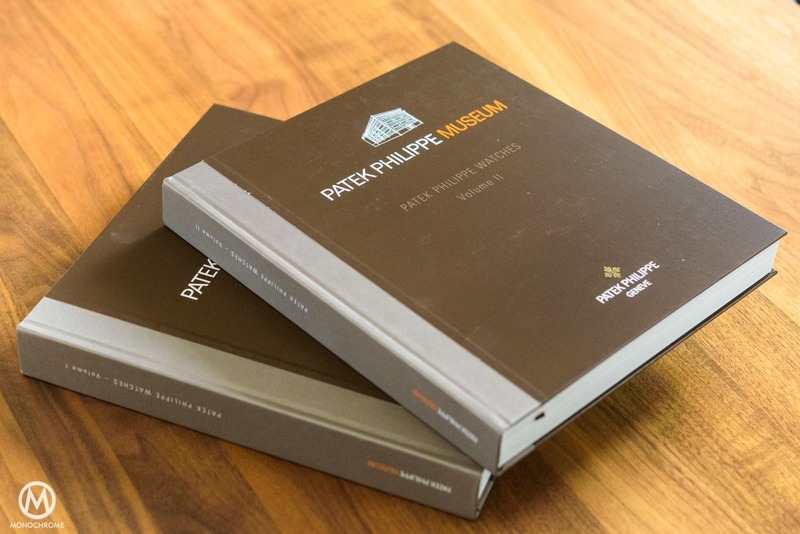 Remember the Twenty-4 meant you could wear a Patek for just over 10k… Not that we question the qualities of this watch but the “aggressive” price certainly played a big part in its sales. The fact that it is a shaped watch and, mainly, that it is powered by the Calibre E15 (an in-house quartz movement) meant that – sadly – we never covered it at MONOCHROME. The Twenty-4 is about to undergo a revolution and the new version is packed with reasons that will convince women who want a beautiful watch and a beautiful (mechanical) movement. 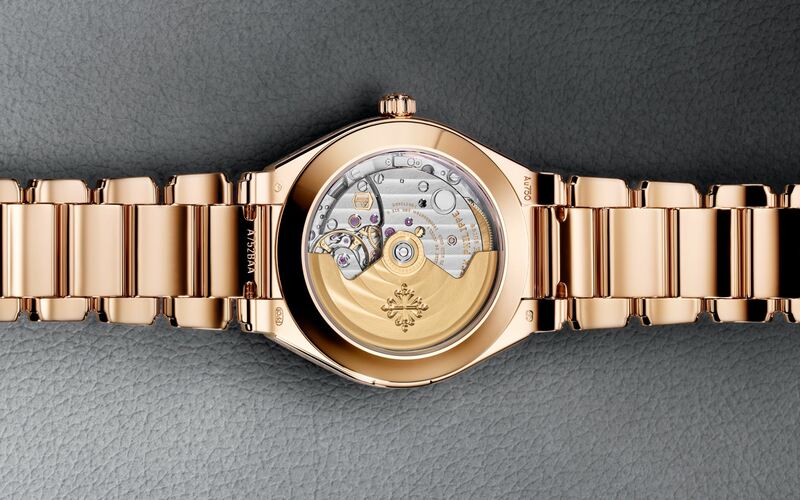 The new Patek Philippe Twenty-4 Automatic is, as clearly indicated by its name, powered by a “real movement” – something that you would expect from a watch with Patek Philippe emblazoned on the dial. However, this isn’t the only change. The brand has decided to drastically alter the concept of the Twenty-4, with the desire to make it more appealing, more modern, more casual – and we’ll let our female readers judge if it is a success or not. First and foremost, the case moves from a rectangular/bracelet-like look to a more classical, round option. Patek has opted for a contemporary diameter of 36mm – again with the idea of targeting a younger clientele. However, this case is far more complex than just a round container. Changing the shape doesn’t mean that it totally eliminates the bracelet-like concept. The bracelet is still seamlessly integrated into the case, with the steps of the links following the steps of the lugs giving the watch a more tonneau-shaped silhouette. The same goes for the inter-lug module that echoes the shape of the central link. 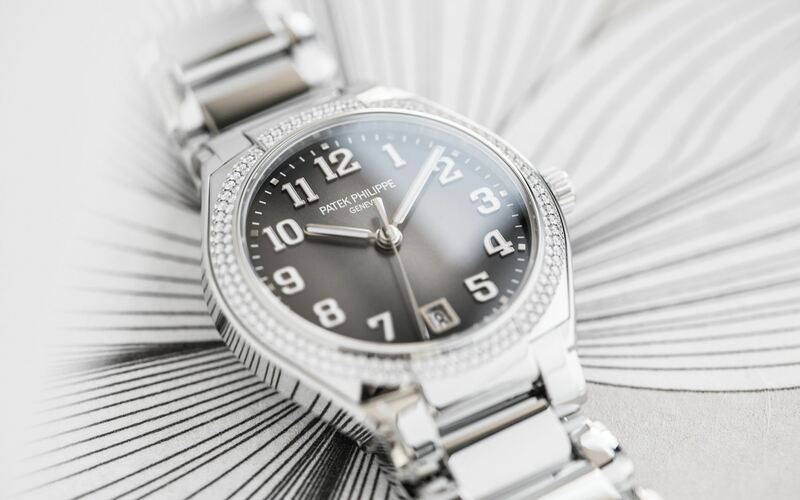 The bezel is also far more complex than just two rows of diamonds surrounding the dial – again, the question of having only paved versions remains debatable, as we know from experience that some younger ladies prefer full metallic watches. The bezel follows the curvature of the case and is raised at 12 and 6 o’clock to create continuity with the bracelet. 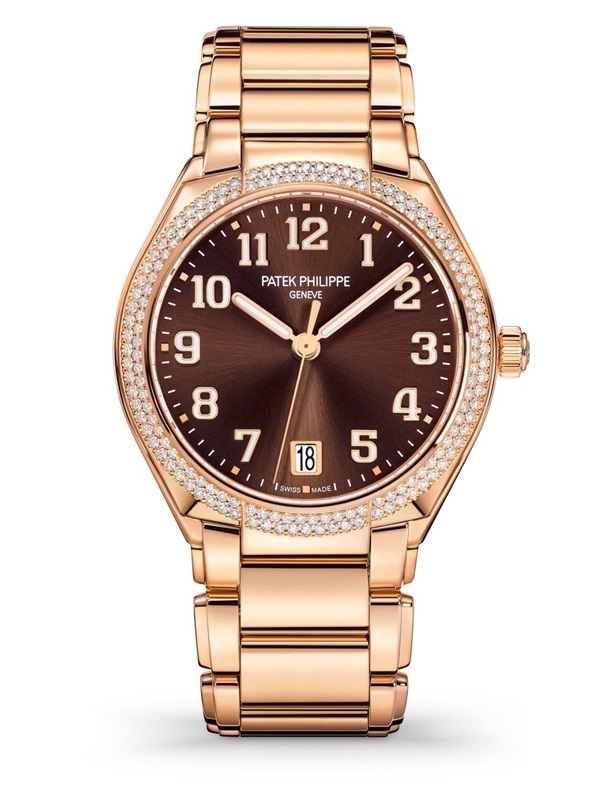 Knowing that, it feels difficult to imagine this watch without a metallic bracelet. The case is slightly thicker than we would have expected, at 10.05mm, but remains comfortable and has a modern presence on the wrist. 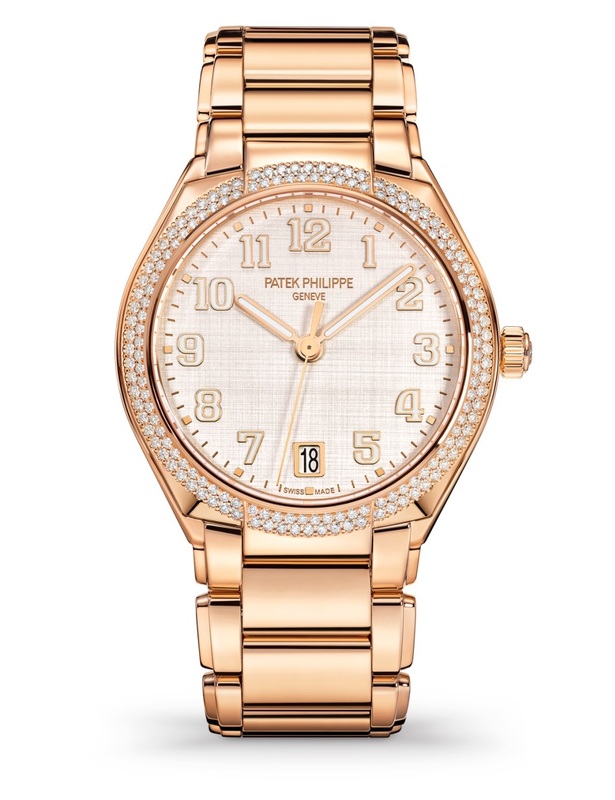 It is a casual-chic watch that can be worn on a daily basis – a sort of all-rounder. 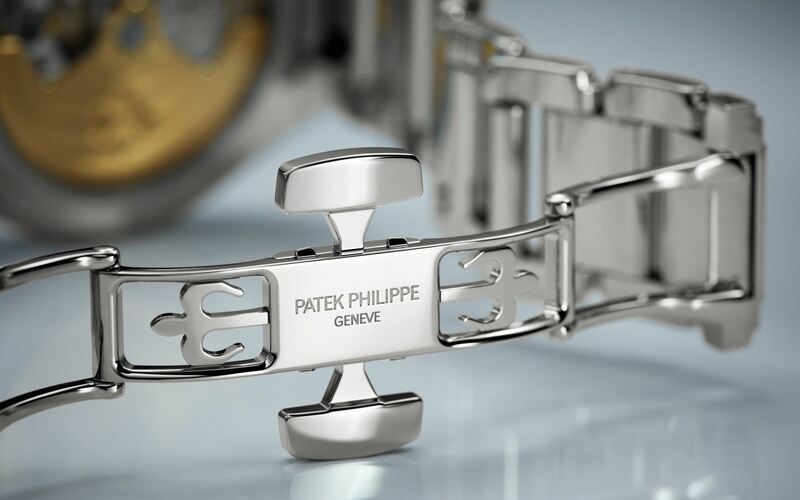 The bracelet has Patek’s new fold-over clasp and the case is water-resistant to 30m. 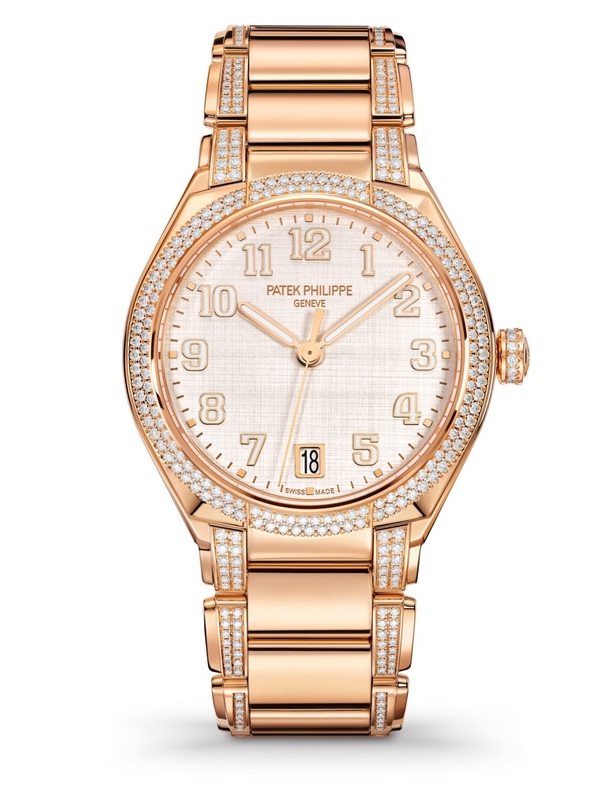 It is available in steel or 18k rose gold, set with 160 diamonds on the bezel – one additional version, the 7300-1201R-001, adds diamonds on the crown, the lugs and the bracelet. 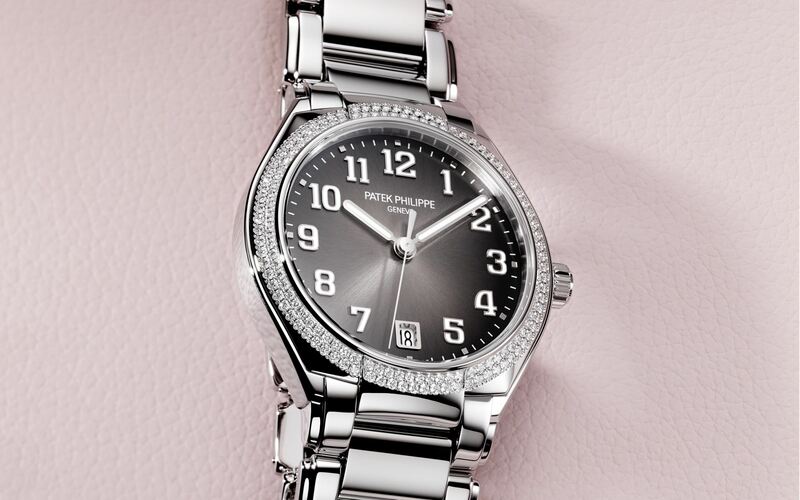 Depending on the version, the new Patek Philippe Twenty-4 Automatic features sunburst dials with the trendy gradient colour-scheme or a silvery-white dial decorated with a double vertical and horizontal satin finish, reminiscent of the texture of wild silk. On all models, the Patek Philippe Twenty-4 Automatic features sporty, pilot-like applied numerals in gold with luminescent coating, echoing the Nautilus-like hands (rounded batons) also treated with luminescent coating. Again the casual-modern intentions behind this watch are evident, even though the mix of pilot watch features and Nautilus elements could have been weird. 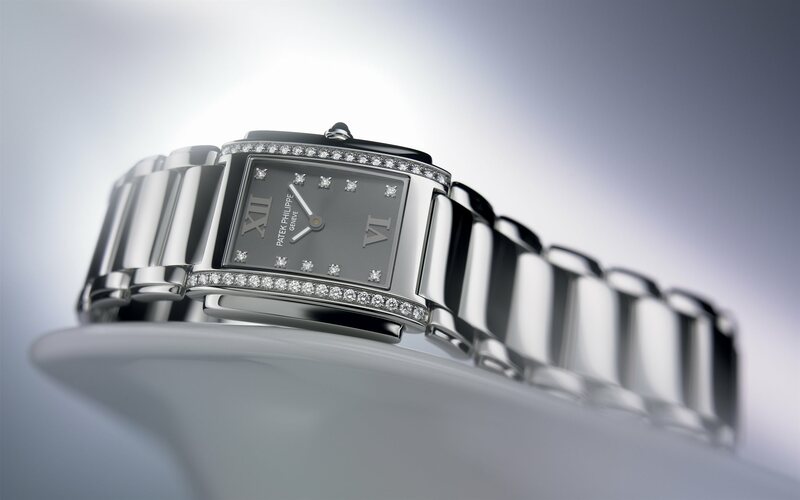 All models are classic time-and-date versions, with the date window positioned at 6 o’clock. 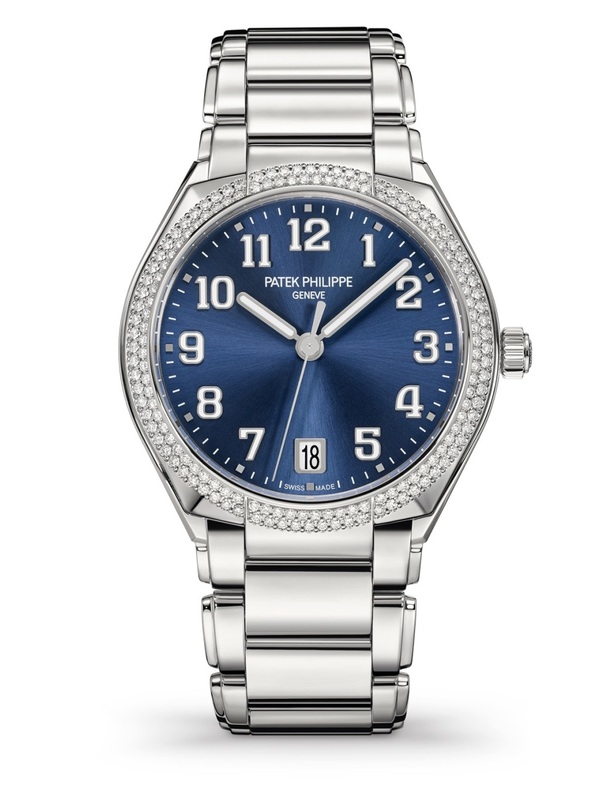 Depending on the model, the dial can be dark blue, grey, brown – all with a sunburst pattern – or silvery-white with a criss-cross pattern. No version with diamonds on the dial has been released yet, even though we can easily imagine some to be launched later. Our main satisfaction with this new, round Patek Philippe Twenty-4 is to see the addition of a real movement and not another quartz-regulated calibre. 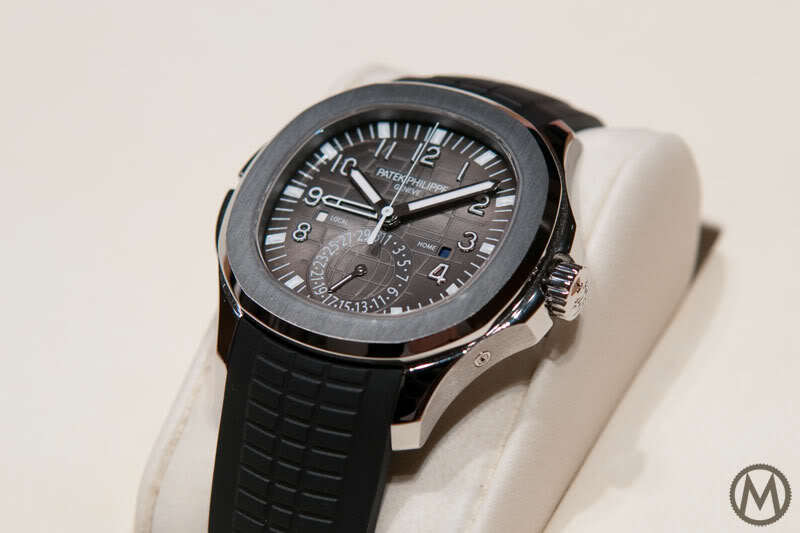 Inside the case is Patek’s emblematic, entry-level self-winding calibre, the 324 – a movement that is found in some Calatravas, in the Aquanaut 5167A or in the Nautilus 5711A. Thin, nicely decorated and equipped with multiple modern technologies (Gyromax and Spiromax escapement parts), it is visible here through a sapphire caseback. This movement is thin, at only 3.3mm, so we’re still a bit surprised by the 10mm height of the case. What remains is a great movement, with a nice 21k gold central rotor, polished bevels and Geneva stripes. This Calibre 324 SC is certified by the Patek Philippe Seal, a guarantee of its excellent execution and of its precision. The prices for this new Patek Philippe Twenty-4 Automatic range from EUR 23,660 for the two steel versions, to EUR 41,150 for the two 18k rose gold versions (no diamonds on the bracelet) and EUR 51,440 for the 18k rose gold with paved bracelet. Availability is to be confirmed. More details on patek.com. Woah I thought the Pilot Travel Time was bad. This makes Michael Kors looks good. Without doubt the worst watch the company has ever released. ugly pointless watch, constellation look better….. I do understand the value of Patek, however sometimes get perturbed by the lack of design innovation while the rest of the industry comparatively lives on the edge. This conservative stability mostly works with them, but gets thin with these “low end” pieces that don’t do much more than cost a lot. The biggest benefit of this aesthetic policy is that little things mean more. The tiny diamonds here present as too costume like for men, but work well for women. 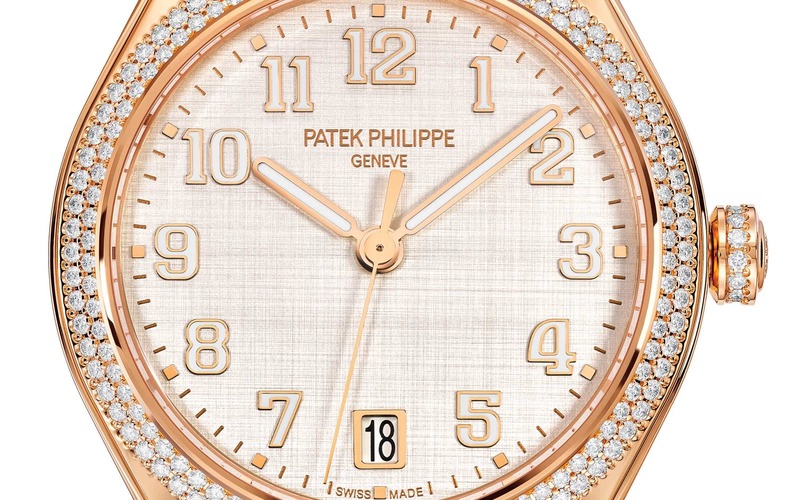 I like the hands and for me the numerals work, but again, the diamonds just seem like unessential accroutrement to an otherwise semi interesting Patek. It’s just a total coincidence, Itzhik. @Itzhik and @Gil – the official launch of this new collection was yesterday. 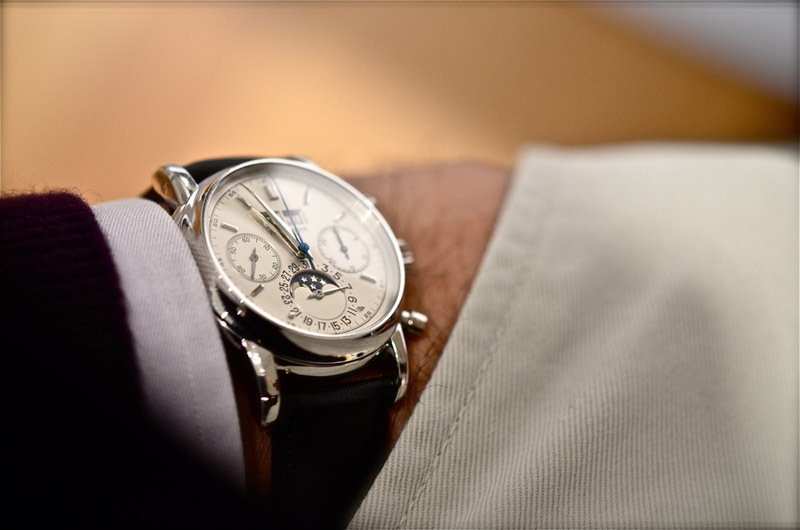 This explains why you can see it on both MONOCHROME and Hodinkee (and more watch media too). This was a ‘news’ story and thus we have reported about this novelty as soon as it was launched. So no PP promotion here.